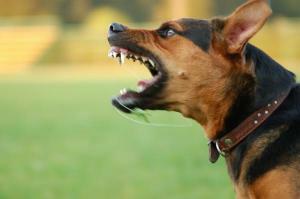 ScienceDaily (Feb. 18, 2009) – In a new, year-long University of Pennsylvania survey of dog owners who use confrontational or aversive methods to train aggressive pets, veterinary researchers have found that most of these animals will continue to be aggressive unless training techniques are modified. The study, published in the current issue of Applied Animal Behavior Science, also showed that using non-aversive or neutral training methods such as additional exercise or rewards elicited very few aggressive responses. The team from the School of Veterinary Medicine at Penn suggest that primary-care veterinarians advise owners of the risks associated with such training methods and provide guidance and resources for safe management of behavior problems. Herron, Frances S. Shofer and Ilana R. Reisner, veterinarians with the Department of Clinical Studies at Penn Vet, produced a 30-item survey for dog owners who made behavioral service appointments at Penn Vet. In the questionnaire, dog owners were asked how they had previously treated aggressive behavior, whether there was a positive, negative or neutral effect on the dogs’ behavior and whether aggressive responses resulted from the method they used. Owners were also asked where they learned of the training technique they employed. Of the 140 surveys completed, the most frequently listed recommendation sources were “self” and “trainers.” Several confrontational methods such as “hit or kick dog for undesirable behavior” (43 percent), “growl at dog” (41 percent), “physically force the release of an item from a dog’s mouth” (39 percent), “alpha roll”physically — rolling the dog onto its back and holding it (31 percent), “stare at or stare down” (30 percent), “dominance down” — physically forcing the dog down onto its side (29 percent) and “grab dog by jowls and shake” (26 percent) elicited an aggressive response from at least 25 percent of the dogs on which they were attempted. In addition, dogs brought to the hospital for aggressive behavior towards familiar people were more likely to respond aggressively to some confrontational techniques than dogs brought in for other behavioral reasons. Prior to seeking the counsel of a veterinary behaviorist, many dog owners attempt behavior-modification techniques suggested by a variety of sources. Recommendations often include the aversive-training techniques listed in the survey, all of which may provoke fearful or defensively aggressive behavior. Their common use may have grown from the idea that canine aggression is rooted in the need for social dominance or to a lack of dominance displayed by the owner. Advocates of this theory therefore suggest owners establish an “alpha” or pack-leader role. The purpose of the Penn Vet study was to assess the behavioral effects and safety risks of techniques used historically by owners of dogs with behavior problems. Adapted from materials provided by University of Pennsylvania. This entry was posted in TV Trainers on May 30, 2015 by renee.